Essential oils are a must-have for anyone that is looking into homemade cleaning products or looking for a better smelling home. Whether you are using vinegar, baking soda, Castile soap, or another natural ingredient as a base for your cleaning solutions, you can get your homemade products smelling amazing with the right essential oils. The problem is that some essential oils are toxic to dogs and cats. I’ve read too many horror stories to not cover this topic thoroughly! If you have pets in your household, please make sure that you are using pet friendly essential oils. And remember that it’s better safe than sorry – always use as few drops as you can manage. It’s not only safer in case your pets get to it, but it’s also cheaper and more sustainable! These days, many people are rightly concerned about the toxic (non-eco-friendly) chemicals found in household commercial cleaning products. They are instead turning to more natural, homemade cleaning solutions. For everything from a general all-purpose cleaner to removing the grime in ovens, to make one’s house smell nice – there is a home-made recipe that can address all of these needs. Adding some pet-friendly essential oils allow for an additional kick in cleaning power and to gets your home smelling quite nice! Essential oils are concentrated oils extracted from plants. Due to the strength and concentration of the oils, one should be careful that the undiluted oils do not come into direct contact with skin (unless discussed with a health professional). Today, we will be discussing adding these to cleaning products to use them in a diluted form. However, even in a diluted form, there are many essential oils toxic to dogs. And even more (in fact, most) essential oils toxic to cats. Households with furry friends and little children should proceed with caution and consult the advice of healthcare and/or veterinary professionals prior to proceeding. If you’re interested in making your own household cleaning products but you have pets in the household, you cannot simply follow a cleaning solution recipe that you find on the internet. 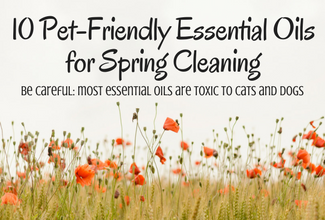 Many of the powerful essential oils typically used in homemade cleaning solutions are toxic to pets. As the list of toxic essential oils is overwhelmingly long, I’ve only included a few of the most popular options. Absolutely not use these essential oils in a household with pets! In addition to those identified above, there are many others that are toxic to either dogs or cats. Instead of listing most of the essential oils out there that are toxic, perhaps it’s easier to simply choose an option from the below list that is pet-friendly! Do note that the internet is full of conflicting information about whether certain essential oils are toxic to cats and dogs. While some resources will say it’s okay, others will warn about toxicity. The point is, practice common sense when you’re cleaning. For example, don’t let your cat walk all over a surface that you just cleaned because whatever liquids were on that surface (whether a commercial cleaner, pure white vinegar, or essential oils) is going to end up on their paws and the only way they can clean themselves is by licking themselves, thereby ingesting whatever it was they walked over. Keep your pets away from the areas that you’re cleaning until the area has time to dry out and diffuse. If you only need 3 drops of essential oils but a “cleaning recipe” calls for 25 drops, just put 3 drops. The vinegar does most of the work anyways. Don’t put essential oils on yourself or your pets without the guidance of a medical professional. Don’t use an oil diffuser if you have pets. After identifying a list of pet-friendly essential oils, I scanned through recently published scientific articles testing the efficacy of each identified essential oil. Here is a list of the top pet-friendly essential oils that also have antibacterial and / or anti-fungal properties (backed by scientific studies). PLEASE NOTE!! I’ve said it before and I’ll say it again because it’s so important. Essential oils are HIGHLY CONCENTRATED forms of their plant material. When using these around pets or small children, LESS IS BETTER. Disclosure: This post contains affiliate links, meaning, if you click through and make a purchase or sign up for a program, I may earn a commission. This is at no additional cost to you. Source: The antibacterial and antifungal activity of six essential oils and their cyto/genotoxicity to human HEL 12469 cells. Source: Antibacterial and antifungal activity of ten essential oils in vitro. Source: The additive and synergistic antimicrobial effects of select frankincense and myrrh oils--a combination from the pharaonic pharmacopoeia. Source: Chemical Composition of Herbal Macerates and Corresponding Commercial Essential Oils and Their Effect on Bacteria Escherichia coli. Source: Antifungal properties of essential oils for improvement of indoor air quality: a review. For a simple pet-friendly household cleaning solution, combine white vinegar and water in a 1:1 ratio. For every 2 cups (or 16 oz or 500ml) of this diluted vinegar water, add 10 drops of essential oils. You can also adjust this to fit your own preferences. Since it’s DIY, you get to control exactly what goes into your cleaning solution. Since we’re thinking from a pet-friendly perspective, try to use only as many drops as is needed to mask the smell of the vinegar. Undiluted vinegar itself is as efficient as commercial surface cleaners at microbial reduction 1 Study by the Journal of Environmental Health testing vinegar in an undiluted form.. Combined with the additional antibacterial, antimicrobial, and /or anti-fungal properties of your combination of essential oils, germs, and other unwanted pathogens won’t stand a chance! If you have an empty spray bottle, you can make your solution in that. Otherwise, I would recommend investing in a tinted glass spray bottle. The glass will hold up nicely over time and the amber tinting will protect against any degradation from ultraviolet light. Making your own cleaning solution allows you to avoid toxic chemicals and plastic waste from store-bought cleaning solutions. It also allows you to choose your favorite scent and adjust the cleaning power to fit your needs. Good for the environment. SAFE FOR PETS. And leaves your home clean and smelling great! As I am not trained in the veterinary sciences nor have a background in holistic health, it is still best to consult with your veterinarian prior to utilizing any essential oil. Essential oils are very potent and used improperly, can result in liver malfunction and other maladies, especially in children and smaller pets. I’m not trying to step on toes here as I’m sure a lot of research has been done but I just wanted to mention that Animal Poison Control has many of the oils listed as potentially dangerous (at least to cats). Lemongrass, Peppermint, and Eucalyptus are all specifically mentioned. I’d like to add that I support essential oils and want to share a little of my research with anyone reading this as to how essential oils are produced and when they become most toxic to help clarify, as well as my own experience with them. These oils are essentially created when the plant is juiced and then boiled down and purified. Most of the essential oils are toxic in their natural form to the animal and therefore have the potential to cause more harm when concentrated. The largest degree of harm is when the oil is directly applied to skin/fur. The second largest is due to oil diffusers. Essential oils diffusers come in 2 different forms. There’s the old version, in which the oils travel up a reed and give off a smell into the air. This version also includes items like Glade plugins. These types are ok. The diffusers of concern are the kind that create a water vapor. This harmful version fuses the oils onto water vapor, which can then attach to the fur of our pets. When our 4 legged friends clean themselves they ingest the oil. They can also inhale large quantities of the vapor. Thanks for sharing your research! Information on safety is definitely not definitive as (thankfully) essential oils are generally not tested on animals so the more info we have, the better. I think what we can conclude on is that the less EOs we can manage with around pets, the better. For the reasons you mention about diffusers, I do not advise pet caretakers to use them. I can’t even use Glade plug-ins because I notice they make my cat’s eyes sensitive. Eucalyptus EO is toxic to cats (not sure about dogs) but it’s definitely an oil to avoid! Thanks for the tip re tea tree oil! That is pretty much the only essential oil I use at the moment, but I never knew that it was toxic for pets! Thankfully we haven’t had any issues yet, as I most commonly use it to clean up pet messes! Also, do you know of any essential oil recipes to kill mold? We get bad mold in the bathroom (gotta love the tropics!) and yesterday I had watering eyes, runny nose, and a bad headache from using conventional mold killer spray – which I would obviously rather avoid! Any ideas would be greatly appreciated! Thanks for the tips. I love essential oils and have two doggies I love very much at home! Appreciate it. I use peppermint EO for my homemade vinegar cleaning solution (50/50 vinegar and water with 10 drops of EO) and haven’t had any problems. However, if you’re worried, I think it’s best to speak to your vet. Perhaps after using the solution, you can spray a second round with water only. This is really great information. I had no idea my oils could harm my cats! Yeah it’s so scary that I think most people don’t know! I’ve heard some sad stories after people started using tea tree oil in their diffusers.